Diverse dining options, gorgeous gardens and unexpected attractions make Portland one of a kind. The PDX Adult Soapbox Derby returns to Mt. Tabor Park each year. In 1845, Portland founders Asa Lovejoy (of Boston) and Francis Pettygrove (of Portland, Maine) famously flipped a coin to name their new Oregon home after one of their previous homes — which is ironic because the place has been an original ever since. Today, Portland stands alone, offering tastes, sights and experiences you won’t find anyplace else. Nowhere is this more evident than at Voodoo Doughnut, a two-location Portland shop that attracts customers with one-of-a-kind treats like the Maple Bacon Bar and the strawberry-dusted, vanilla-frosted, chocolate-cake Neapolitan doughnut. Open 24 hours a day, almost every day of the year, Voodoo is a unique take on breakfast, whatever time you wake. With several small bars and a brewery, McMenamins Kennedy School is an unusual place to get an education in hops and barley. Now home to a 57-room hotel, the decommissioned 1915 schoolhouse even allows cigar smoking (in the “Detention Bar”). And with Portland’s 75-plus breweries (more than any other city in the world), there’s no better place to work on your advanced degree in beer appreciation. Serving up original recipes all over town, from the PB&J Fries at Potato Champion to the Korean tacos of Koi Fusion, hundreds of local food carts also help define Portland’s inimitable DNA. Portland’s culinary scene, home to acclaimed restaurants like Pok Pok, Le Pigeon, Beast and Paley’s Place, among many others, has garnered international attention for its dedication to local ingredients, its unbridled creativity and its affordability. Though it was built by artisans in Suzhou and imported brick-by-brick from China, the Lan Su Chinese Garden is pure Portland. Taking up an entire block of the Old Town Chinatown district, the oasis has a relaxing tea house that serves authentic brews from local purveyor The Tao of Tea. Many of the blooms found in Washington Park’s International Rose Test Garden were also imported, but as a testing ground for new hybrids, the colorful park is a must-see (and -sniff) landmark. The 5,172-acre Forest Park, meanwhile, is the largest, forested natural area within city limits in the U.S. As home to more than 100 species of birds and dozens of kinds of mammals, it’s an unparalleled urban wildlife asylum with miles of hiking and biking trails. As for man-made marvels, Stumptown has more than its share. Built by skateboarders without the city’s permission, the Burnside Skatepark is a massive cement mecca to the sport located under the Burnside Bridge’s eastern side. Eventually approved by the local government, the rebellious ramps and half-pipes are community run and packed with skaters — sometimes even pros like Tony Hawk stop by, too. The atmosphere is much less competitive at Oaks Amusement Park, where the Northwest’s largest roller rink still features a nostalgic old pipe organ. Since opening in 1905, the park has provided nearly a century of nonstop kid-friendly games, rides and memories. And while the renovated Crystal Ballroom is not quite as old, it has an equally astounding vintage feature: a 90-year-old, mechanical “floating” dance floor that has springs under its surface, keeping dancers bouncing around and moving like nowhere else. To understand the bumper stickers and Old Town mural calling to “Keep Portland Weird,” look no further than the weird ways that Portlanders celebrate, from the thousands-strong World Naked Bike Ride to the daredevil antics of the Zoobombers and the PDX Adult Soapbox Derby. Not as weird, but no less distinctive, are the beer festivals held nearly every month (and nearly every week in the summer), which include celebrations of specific types of beer, like organic, sour, rye and fruit. Hundreds of food carts serve up original recipes all over town, from the PB&J Fries at Potato Champion to the Korean tacos of Koi Fusion. 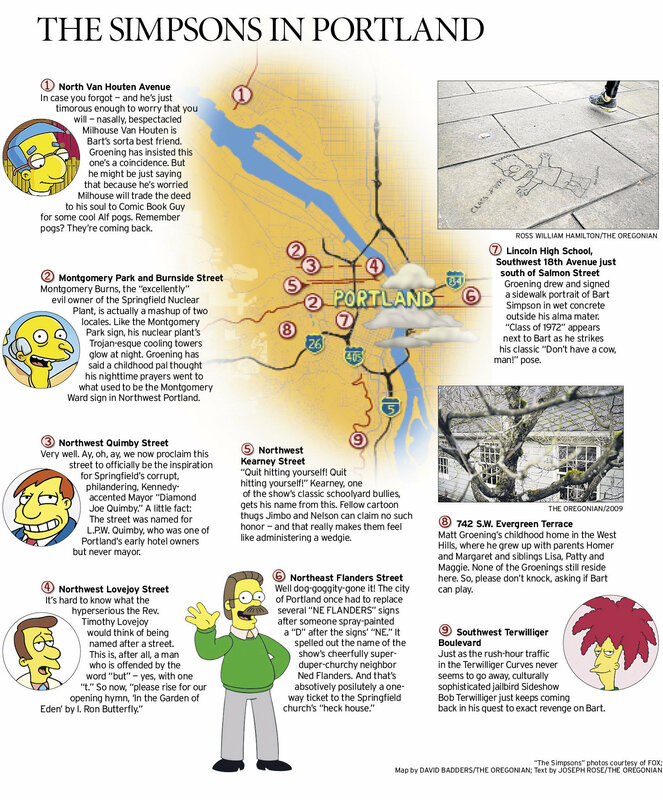 Many of the characters in “The Simpsons” are named after streets and locations in Portland, Simpsons’ creator Matt Groening’s hometown. When you’re here, look for NW Lovejoy and Quimby streets, Montgomery Park and NE(d) Flanders street.